Difference in the online slots world is a good thing. With thousands of games on the market, anything that's even a little bit out of the norm starkly stands out – and that's where Multifruit 81 comes into play. 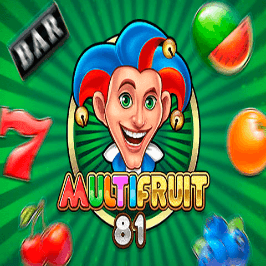 Developed by Play'n GO and bringing a new look to the fruit machine theme, the Multifruit 81 online slot game is one you just have to check out. Of course, we can't simply say that and not back it up. With this in mind, we've put together a Multifruit 81 slot review to help you see why this spinner is unique in the industry. 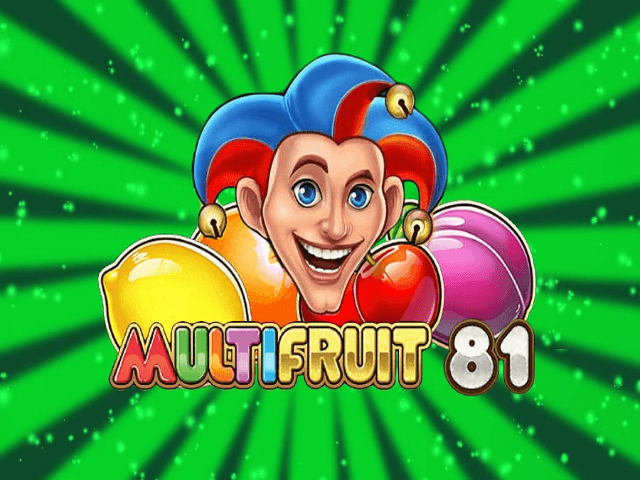 Play Multifruit 81 Slot Demo for Free! Play Multifruit 81 for Real Money! What's the basis of this game? It goes without saying (though we will anyway) that fruit machine gaming is clearly the theme. Thanks to a combination of classic colours (i.e. green, gold and orange), fruits and bar symbols, this video slot conjures up images of gaming days of old in bygone pubs. The difference is, and this is where Multifruit 81 separates itself from the pack, there are just four reels in play. Instead of conforming to the three or five-reel norms, the design team at Play'n GO has endowed this game with an even number. Whether this dynamic appeals to you will be a matter of personal preference. But, one thing is true: Multifruit 81 breaks the mould. 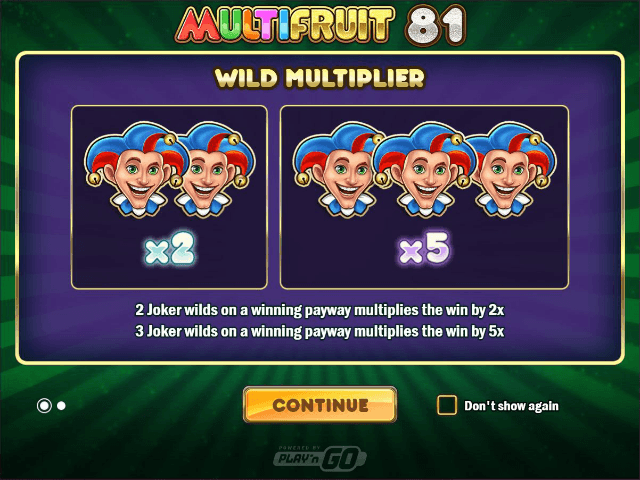 Offering an original gaming experience is something that the development team at Play'n GO is known for; Multifruit 81 combines this innovation with the ultimate old-school slot machine style. To find out if four reels appeal to you, you'll have to set your bets by scrolling through a selection of betting amounts. Although the betting bar is somewhat cumbersome in terms of moving through the amounts (you have to click through each individual amount), it does play into this game's retro vibe. Once you've found an amount between 0.02 and 100 units, the spin button will set a selection of classic fruits (cherries, lemons and oranges) and bars in motion. Matching three bars at the lowest stakes will earn you a prize worth 0.01 units, while four red sevens at the top stakes will get you a 10,000 unit prize. 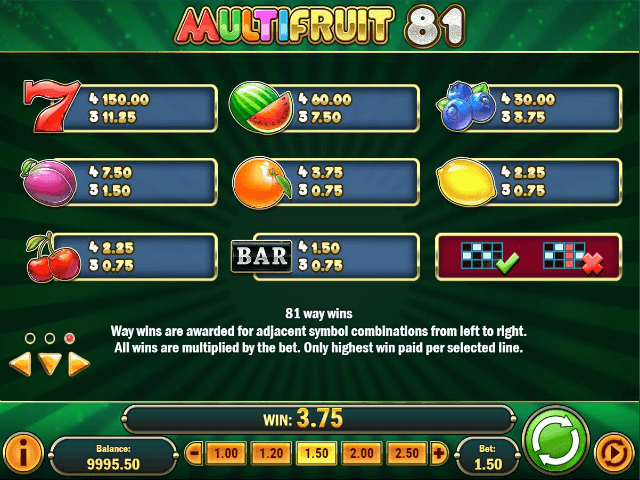 With 81 ways to win, Multifruit 81 gives you plenty of opportunities to bank a jackpot, which is certainly respectable. To give this game a little extra spice, the developers have ripened the payout table with expanding wilds that can unlock a 50,000 unit prize. Rolling in two joker wilds will double any prizes in view, while three multiplies them by five. When you line-up four jokers, at any stakes, you'll win a major prize that can be worth as much as 50,000 units. If you're looking for an interesting blend of classic and up to the minute, Multifruit 81 slot is a winner. Taking the best bits of the fruit machine genre and combining them with some innovative little twists, this Play'n GO video slot will keep you spinning til you're on the money. Share this Multifruit 81 Review today! 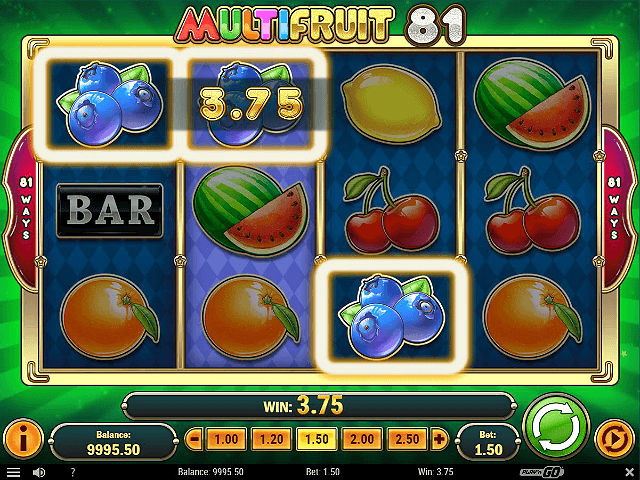 If you like Multifruit 81, you'll love these slot titles too!